Jon Rubinstein was the star at CES 2009. Making the introduction of the Palm Pre and webOS, Rubinstein commanded the stage showing off the phone that everyone said was going to be a strong challenger to the Apple iPhone. Who could have predicted that the CES announcement would be the peak for both the Palm Pre and Rubinstein. By June, the Pre had a tepid launch and Rubinstein was appointed CEO of a sinking ship. 10 months later, Palm was sold to HP. 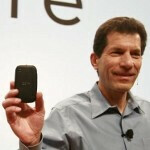 In an interview with Fierce Wireless, Rubinstein says that if he had to do it again, he would not have sold Palm to HP. Calling the sale "a waste," Rubinstein said that HP never gave Palm "a chance to flourish." He also cited the deal that Palm had with Verizon as one of the things that he looks back at and wishes he could change in hindsight. Another thing he wishes he could change was the limited exclusivity that Palm gave to Sprint for the Palm Pre. According to Rubinstein, the company almost had deals with Verizon and Vodafone and was negotiating with everyone. Sprint gave Palm the best deal at the time. Currently on the boards of Amazon and Qualcomm, Rubinstein said that while at Palm, he used to argue with the carriers about things that they wanted on Palm phones like their own address books. He notes how the industry has turned away from the carriers toward the manufacturers as the carriers have become nothing more than service providers. He also agrees with the notion that some of the multitasking features of iOS 7, which was introduced on Monday by Apple, harkens back to webOS. On Monday, we pointed out that Apple's new mobile OS allows you to view which apps you have open and close them with a flick upward that moves the app off the screen and closes it. That is exactly how web OS users would close an open app on that operating system. How is that innovation apple is stealing from palm smh! Palm OS is IHO toast, Apple's iOS lives on. Why you ask, Apple integrates hardware and software, something Rubinstein ought to have known since he had worked at Apple. Last time anyone checked, android OEMs do not integrate hardware and software at the same level as Apple. Completely agree w/ Rubinstein! I use to own the Palm Pre and loved the OS. Wish they would've tried to make a comeback or sold the OS to someone who would've actually done something w/ the OS. I agree, HP didn't want to throw the ecessary resources behind WebOS. I miss Palm and agree with this assessment, HP lacked the vision to know what to do with a great OS and now it's dead. Fortunate for Google that it freed up Mathias Duarte to help polish Android. WebOS had promise, but yeah the Pre was too small even by 2009 standards. The Pre 3 was a good looking phone, but by then WebOS was on its deathbed. 3.2" was pretty much the standard screen size in 2009 for a lot of Android phones. It was only later in the year that 3.7" started picking up and then 2010 with the Evo that 4.3" started coming out. This was century's ago in tech time. Blackberry Q10 has a 3.1" display on it four years after the Palm Pre was released. Wish Palm had used the tried and true form factors (example: Palm Treo Pro) yes it had a poor battery life, however, it had the Touchstone charging dock which was ahead of its time, charging wirelessly. WebOS should have been given a better opportunity, HP was not willing to develope it, as it should have, as any OS needs. He's right buying PALM by hP was a waste. Now it's dead. Hey palm, how about you should have learned your lesson back in 2005 and *listened* to your customers when they wanted a full screen PDA/phone with wifi? You know, like a lifedrive but with a phone? No, you were an idiot and released the Pre on an unwanted chicklet keyboard form factor. You deserved to go under. Sorry. The webOS phones were too small and too cheaply made to compete. webOS itself was too slow, laggy and buggy for even the most patient webOS fans. It's still the nicest looking OS I've seen, but even the Touchpad was slow, slow, slow! @threed61 , strange... i have touchpad and mine is not slow/lag, do u update your OS? maybe your touchpad got virus? Could HP please, PLEASE start giving Apple a taste of their own medicine and sue the crap out of them?! Or I bet you can make a killing selling Palm patents to Samsung right now. Apple didn't copy their design, and I'm not aware of any patent they'd be infringing so lawsuit is unlikely.